Before being promoted to lead the endoVenous business in 2014, Sandra previously assumed responsibility for the Renal Denervation business of Covidien. Only four months after taking this new role, Sandra made the recommendation that Covidien close down the Renal Denervation business in favor of exploring other opportunities in that space. Her decision to exit the Renal Denervation program signaled her commitment to the company’s business and to providing best-in-class treatment options. Sandra has been with Covidien since 2010, when she joined as Regional Director for Northern Europe, operating out of Paris. In 2011, Sandra became VP of Sales & Marketing for endoVascular, which was the fastest growing franchise in Europe during her time. She also developed the company’s global vascular embolization strategy, which was adopted globally by Covidien, and remains the strategy of Medtronic today. 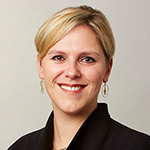 She previously held leadership roles within Siemens’ ultrasound businesses.